BLANTYRE, Malawi (Thomson Reuters Foundation) – Last November, rangers in Malawi’s Lengwe National Park arrested 35 illegal loggers within the park boundaries as they felled timber with a half-million dollars worth of equipment brought in via an illegal road from neighboring Mozambique. Satellite images suggest about a million protected mopane trees had been cut in just over a year in the area where the group was working – a loss valued at about $37 million in court depositions. Such illegal logging is a widespread problem across Africa – one that often remains unseen, unprosecuted or met with fines far below the value of the stolen timber. But last week, Malawi indicated it is prepared to crack down hard on such theft, with all 35 loggers – including 22 Mozambicans, 10 Malawians, two Chinese and one Portuguese-Mozambican dual national – given sentences of between 12 and 18 months of hard labor in a Malawi prison, with little chance of parole. The crew’s equipment – tractors, trucks, motorcycles, saws and other gear – also was confiscated, with some of it repurposed for the national park’s own use. Valued by the court at half a million dollars, it is many times larger than the park’s own modest budget. “We are quite happy with the sentence passed down by the courts, as well as the forfeiture of the equipment, which means quite a lot,” said Brighton Kumchedwa, Malawi National Parks and Wildlife director. The prosecution, on charges of logging in a national park and immigration violations, follows the passage of a new National Parks and Wildlife Act, which allows for sentences of up to 30 years for environmental crimes. The act, passed after the high-profile arrest of the loggers, is intended to act as a stiff deterrent to future potential timber thieves. Kumchedwa called the Lengwe National Park case an important signal by the courts that natural resource theft will now be prosecuted as a serious crime in the southern African nation. “Already we have seen some courts responding well to the new law, where we have seen much longer custodial sentences,” he said. Researchers say the Lengwe National Park case helps peel back a shroud of secrecy about how international illegal logging syndicates work in the region, with European and Chinese nationals moving illicit timber from Malawi into Mozambique and then overseas through Mozambique’s northern sea ports. Mozambique’s government is aware that the country is a portal for illegal timber being shipped to Asia and has been trying to stop it with recent high-profile arrests and seizures. Despite this, a January investigation by the Oxpeckers Center for Investigative Environmental Journalism in Africa found logs still being exported from Pemba harbor despite the government issuing a two-year export ban on all unprocessed hardwood timber leaving the country. That ban was put in place in December by Mozambique’s Ministry of Land, Environment and Rural Development. According to the United Nations’ Food and Agriculture Organization, Malawi has the highest rate of deforestation in southern Africa, and is losing about 3-4 percent of its forests annually. “Timber theft is widespread and we need to work together to stop it,” said Julian Bayliss, a technical adviser to Malawi’s government on protected areas and biodiversity management. Bayliss works out of Malawi’s southern city of Blantyre, where the once tree-covered hillsides are already largely bare from decades of deforestation. “Most of the commercial timber has been removed or is in the process of being removed from the landscape outside protected areas. What we are starting to see now, which is extremely worrying, is illegal timber theft from inside protected areas,” he said. Although the latest prosecution was successful, most timber theft worldwide is not prosecuted. According to a recent Interpol report, illegal logging and sales cost governments between $51 billion and $152 billion a year in lost revenue alone. This does not count the loss of ecological services from deforestation, such as maintenance of rainfall patterns, or the downstream agricultural costs of increased water runoff and erosion. Last year, a team of seven Malawian rangers found the now-prosecuted illegal logging operation deep in Lengwe National Park, having gained access after cutting a road in from next-door Mozambique. Felled logs were removed to a processing facility in that country, the court case said. After finding the crew, rangers needed almost three days to drag the arrested men and gear back to park headquarters through an area of roadless wilderness, according to the rangers’ court deposition. Joseph Kamkwasi, a lawyer for those convicted, said he would appeal the sentences. “There are sufficient grounds to appeal the sentence because it is manifestly exaggerated,” he told Radio Mozambique. Bayliss believes new laws, like Malawi’s new Wildlife Act, can be effective, but cross-border cooperation is needed to effectively curb deforestation. In an analysis of the case written for the East African newspaper, Gabrielle Lynch, a professor at Britain’s University of Warwick, said that corruption is often a major problem in prosecuting timber and wildlife thefts in Africa, and that lack of solid evidence can also make prosecution difficult. But Kumchedwa, the director of Malawi’s national parks, said the Lengwe National Park case represents an important signal that natural resource theft now will be prosecuted as a serious crime in Malawi. “My warning to the criminals is that we will not relent until we are done with them,” he said. 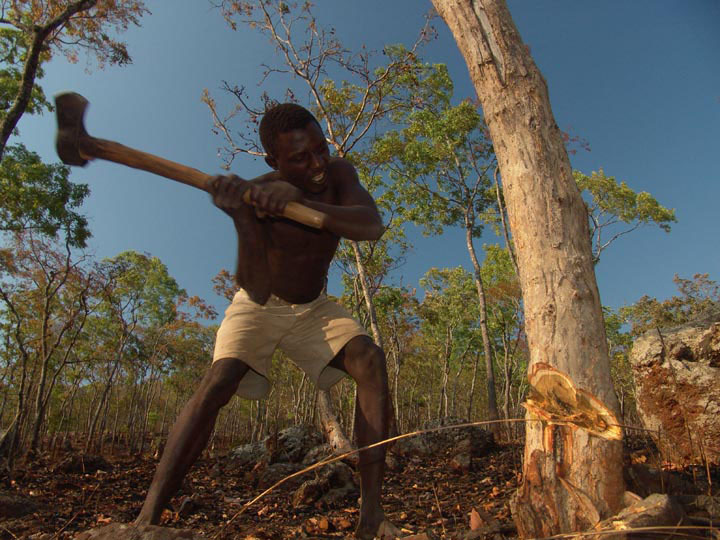 Logger Joseph Singano cuts a hardwood tree in a burnt-out forest on Malosa Mountain in Malawi. The forest floor was burned by the men a few months ago while making charcoal. He is an illegal logger, and has watched the forest recede kilometers in the last few years. The country of Malawi loses 2.8% of its forested land every year to illegal logging. This central African country used to be completely forested, and now has only about 20% of its total area under a canopy of trees. This entry was posted in Climate Change, Environment, Featured Articles and tagged china, hardwood, illegal, logging, malawi, mozambique, poaching, prosecution. Jeffrey Barbee is a photojournalist and award-winning film producer and director. He works for Global Post, presents the US national TV show Earth Focus for LinkTV and writes and photographs for the Guardian UK. His work also appears in the New York Times, the BBC, NOS Tv Holland, Smithsonian Magazine, RTL News, PBS, CBS, Al Jazeera, Time Magazine, Newsweek, Vanity Fair and others. His 2012 film Creating a Climate For Change won best environmental film at the film festival of Colorado. He is the Director of The High Cost Of Cheap Gas, a current feature film exposing the global gas industry. He is the Director of Alliance Earth, a worldwide not-for-profit environmental and scientific reporting initiative and is a board member of the Mezimbite Forest Centre.